I got to try this amazing Cookie Cake creation thanks to Sassi Co! Amazingly extravagant and owning its wow factor, I gave it a taste test to see if this dessert lover's dream lived up to my high hopes. Honestly when I opened the box my first thought was that Willy Wonka had gone nuts and created this giant cookie cake. Do not underestimate its 25cm diameter size - it's huge. It also lulls you into a false sense that you could actually finish it yourself (you can't...trust me). Apart from the shock of it all it really is presented so cutely and with so many great bits and pieces as toppings. This topping isn't just there for looks though...they also add to the amazing texture of this dessert. You can see for yourself though - this is stunning and definitely brings the wow factor to any special occasion you bring it to! I'm not going to mince my words...this was so delicious. I'm probably biased though because I have a major sweet tooth. Let's start with the cookie base. Being so thick you would expect it to either break your teeth or be undercooked but this was perfectly moist and fudgey like a good choc chip cookie should be like. An additional surprise crunch was also there because of the smarties baked into it. Moist, sweet, crunch and chocolate - What's there not to love! 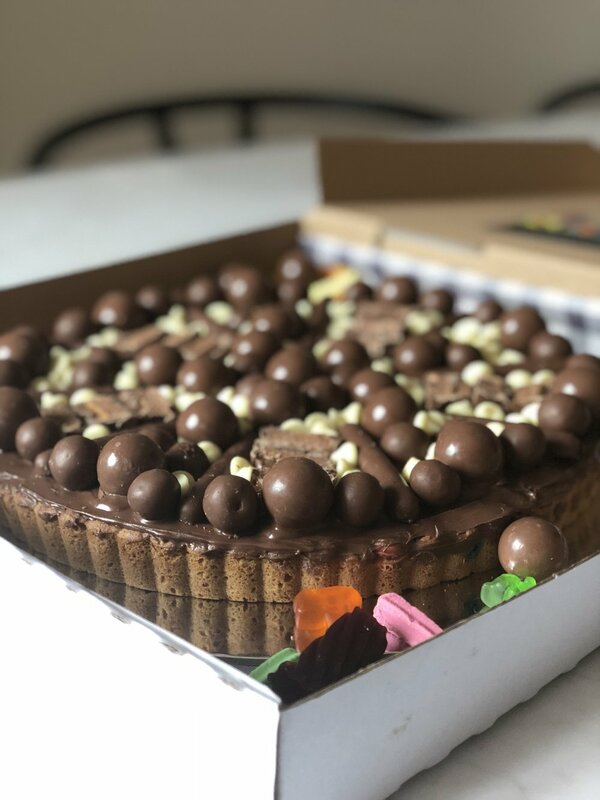 The toppings were a great accompaniment to the cookie base as it added some additional textures and levels of sweetness from the white chocolate nibs, chocolate biscuits, malteasers and creamy Nutella spread. I would argue that there was a bit too much added on top because it was really sweet but also...it was part of the decadence and wow factor of it all. You get to pick and choose what you get and the slices you get - personally I LOVED the Mars Bars slices as they added a caramel kick to it which is my personal favourite. This is definite not for the casual sweet tooth and definitely to be shared with many, many people. I probably had 2-3 bites before I needed a good tall glass of water and a break. Despite this I get going back for more throughout the days and shared it with many friends and family who all shared one opinion...IT WAS DELICIOUS! For the size and sheer amount of variety you get I would highly recommend Dotty Coco for any party get together. There are so many different flavours to choose from too so you're spoilt for choice to be honest. Get on it and order one for your next party! Thanks again to Sassi Co for introducing me to this gobsmacking dessert!